British-Irish institutions need strengthening to face the challenges of Brexit. In this post, on the 20th anniversary of the Good Friday Agreement and ahead of the UK’s impending exit from the EU, Etain Tannam (Trinity College Dublin) invokes John Hume’s approach to peace-making to highlight current weaknesses in policy-making. 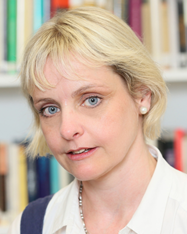 She argues that Hume’s concept of the totality of British-Irish relations has taken on new importance and is as significant as it was thirty years ago. On the eve of the 20th anniversary of the Good Friday Agreement, Bill Clinton, Tony Blair and Bertie Ahern, as well as George Mitchell, asked that British and Irish governments devote more energy to help restore the Executive in Northern Ireland and to face the challenges of Brexit. The call came amid various accounts that British-Irish relations were extremely tense. The next day, David Davis, the UK’s Brexit Secretary, accused the Irish government of bowing to Sinn Fein pressure. The accusation was unusual in that a UK government minister made such allegations publicly and explicitly, though there had been similar commentaries in the Telegraph. It marked another low in the contemporary bilateral relationship. It is fitting on the 20th anniversary of the Good Friday Agreement to recall John Hume’s analysis of the need for British-Irish cooperation – Strand Three of the Good Friday Agreement. John Hume’s three strands approach underpinned the Agreement: Strand One refers to relations between nationalists and unionists in Northern Ireland and provided for the devolved consociational Executive. Strand Two refers to cross-border relations between Northern Ireland and Ireland and provided for the North-South Ministerial Council. Strand Three refers to British-Irish intergovernmental cooperation and provided for the British-Irish Intergovernmental Conference to comprise heads of governments and ministers meeting formally. It also provided for the British-Irish Council, comprising government/devolved government leaders, or their delegates from Ireland, Northern Ireland, Wales, England, Scotland and the Crown Dependencies. Under the Agreement, ‘the Conference will bring together the British and Irish Governments to promote bilateral co-operation at all levels on all matters of mutual interest within the competence of both Governments’. For Hume, all three strands were essential to the peace process – the ‘totality of relations’. Particular emphasis was placed on the need for British-Irish intergovernmental cooperation between the kinship states. Current tensions in the bilateral relationship do not bode well for efforts to restore the Executive in Northern Ireland and for efforts to protect a soft border when the UK leaves the EU. The complexity of dealing both with Northern Irish internal political issues and also Brexit issues of deep sensitivity to nationalists an unionists implies that restoring the Executive requires intensive engagement at all levels. There have been increased references to the need to reconvene the British-Irish Intergovernmental Conference, but the argument that British-Irish cooperation is necessary can sound like a mantra. After all, is it not up to the parties in Northern Ireland to sort things out, now that they have their own devolved government? Alternatively, the basis for requesting bilateral cooperation can become an assumed ‘given’, because cooperation occurred in the 1990s, so it is assumed it is needed now. However, digging deeper shows the reasons why such cooperation was cultivated and sought by John Hume and by successive Irish governments. Hume’s core argument was that the Northern Irish conflict was a clash of identities and only by reassuring identities that they would be protected within the UK and Irish states, would peace occur. For nationalists in Northern Ireland, the Irish government was the guarantor of their identity, and for unionists, the UK government was the guarantor. According to this view, it was nationalists’ fear of having no protection that drove a minority of nationalists to use violence, despite the peaceful path espoused by Hume and the SDLP and supported by a majority of nationalists. Irish governmental involvement was essential to stem nationalists’ disaffection. The UK government had the resources and legal authority to frame a carrot and stick strategy to incentivise cooperation in Northern Ireland and the Irish government by the 1990s was seen as having a legitimate right to help carve that strategy, as the protector of the nationalist minority. Building in that security blanket was seen as crucial to any peace agreement. The peace process from the 1980s onwards was about the ‘totality of relations’, not just an internal Northern Irish affair. The EU model of post-war cooperation also influenced Hume’s strategy. As RTE reporter Tommie Gorman recently highlighted, Hume was deeply influenced by the model of post-war Franco-German cooperation in the EU. 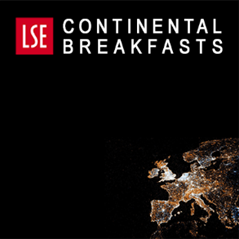 For Hume, the evolution of post-war cooperation was connected not just to the idea of a European federal union superceding nationalism, but to the EU’s specific institutional framework. It was not a woolly aspirational idea, but had a clear process via institutional innovation. The Council of Ministers and later the European Council created an obligation that ministers and heads of government frequently meet face-to-face. These formal institutions ensured that consensual decision-making and problem-solving processes evolved and typified EU policy-making, rather than confrontation and zero-sum stalemates. The Good Friday Agreement’s concepts of veto power for minorities in areas of key concern and of power-sharing drew the EU’s institutional model, reflecting Hume’s belief in the EU as a framework for cooperation. 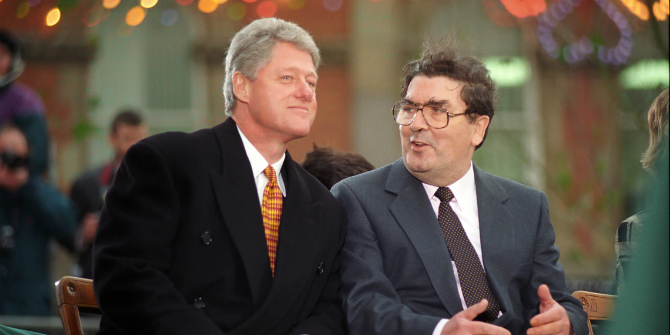 Bill Clinton and John Hume. Image by Academy of Achievement licenced under this Creative Commons (CC) license. Long before the Good Friday Agreement, summits and British Irish institutions for cooperation were key components in Hume’s thinking and influenced successive Irish governments from then taoiseach Charles Haughey’s famous ‘teapot summit’ with Margaret Thatcher in 1980 to the many joint statements and summits of the 1990s. These summits occurred regardless of whether a Labour or Conservative government was in power in the UK, or a Fianna Fail, or Fine Gael- led government was in power in Ireland. Because the institutions had formal rules that obliged members to meet, they met regardless of ideology or disagreements. However, British-Irish institutions were crucial not just because politicians were obliged to meet face to face and discuss issues. Liz O’Donnell, the former Progressive Democrat politician, has commented how in the Good Friday Agreement negotiations, politicians had to be cordial and conciliatory because they saw each other three times a week or more – they knew they would have to face each other soon again. Similarly, the Hume/EU logic was that if politicians knew they would have to meet again soon, because the institutional rules demanded it, they would be more likely to be cooperative. In theoretical terms, the concept of the iterated game where cooperation increases in situations where actors meet repeatedly over time, even where they start with very conflicting preferences, fits the empirical evidence of the evolution of British-Irish intergovernmental cooperation. What is worrying on the 20th anniversary of the Good Friday Agreement is that as years passed, the focus became almost solely on internal politics in Northern Ireland. The assumption was implicit that politicians in Northern Ireland could switch from decades of animosity to ‘normal’ democratic politics. In fact, the transition has been far more laboured, and politics in Northern Ireland is still fragile. Strand Two’s cross-border institutions met, but were contingent on the Executive functioning and did not flourish. Despite Brexit and despite recent reports of intense Irish governmental efforts to increase the UK government’s engagement, the British-Irish Intergovernmental Conference has not met at all since 2007. 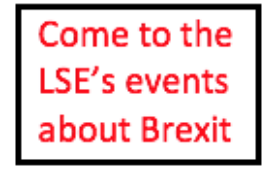 Yet, under the Good Friday Agreement, the Conference is empowered to meet to discuss non-devolved issues of common bilateral concern – surely Brexit is such a matter. Doubtless, sensitivity to Unionist concerns about the Conference has contributed to its weakness. However, the British-Irish strategy of the 1980s and 1990s found ways around political sensitivities. Whether the UK government has the time or inclination to engage more intensively with the irish government, given the mammoth task of managing Brexit, is a moot point. However, the assumption that Strand One suffices to maintain stability has been sorely tested. For Hume’s approach, Strands Two and Three were not simply part of some package deal to pacify unionists and nationalists. They had been integral to his strategy to Northern Ireland from the 1970s and they rested on a deep appreciation of the need for cross-border and bilateral institutions, emulating the EU model. On the 20th anniversary of the Good Friday Agreement, with Brexit looming, Hume’s concept of the totality of relations has taken on new importance and is as significant as it was thirty years ago. Brexit seems to be the big bogey-man here. Common membership of the EU by the UK and the Irish Republic re-assured both unionists and nationalists. Brexit, with the threat of a new North-South border, clearly most unsettles nationalists. However many moderate unionists have no desire to see a return of the physical frontier either, as they know this would create a psychological barrier as well. To double complicate things, the Tory government would be in a minority without the votes of the DUP, a strongly pro-Brexit and anti-nationalist party. The fires of extreme nationalism, which were once seen as a disease of the non-Western world, now infect the heart of the Western world as well.